In our last installment on trees, we studied and implemented the AVL tree. The AVL tree is one of many self-balancing binary search trees, a special kind of BST that enforces sub-linear operation costs by maintaining tree height close to the theoretical minimum of . This is usually done by what is called tree rotation, which is basically moving around tree nodes (and updating some special node properties). As you can see in the Wikipedia page¹, AVL trees guarantee that the tree height is strictly less than , while Red-black trees have a slightly worse threshold of ; thus, AVL trees will provide significantly better search times than Red-black trees. However, while AVL trees may need to do rotations after each insertion, Red-black trees must do at most 2 rotations per insertion. So either one may be your tree of choice depending on the application: if search time is critical but data doesn’t get updated too often, an AVL tree will perform better; whereas a Red-black tree will perform better in scenarios where data is constantly being changed. These four properties are sufficient to enforce that tree height is always less than . These properties are maintained by applying tree rotations (which are very similar to the ones performed in AVL trees) and by swapping node colors. The concept of Red-black trees is deceivingly simple, whilst implementation can become complicated, even more so in C, our language of choice for this kind of stuff. 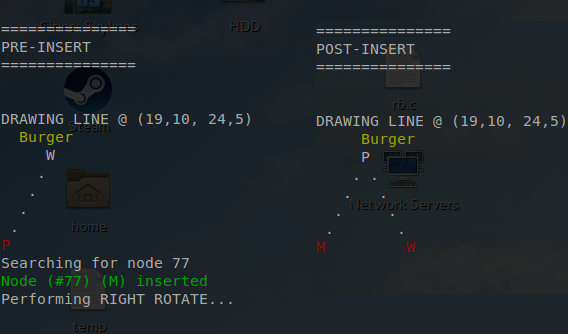 Node U is inserted as a right child of S, violating rule 3 again, and the subtree K < S < U is left-rotated. However, even after rotation rule 3 is still violated, since S and U are both red. Rule 4 is violated as well: since K is black and U is red, S has paths with different amounts of black nodes (2 on the left and 1 on the right – remember than null leafs count as black nodes). This is fixed by swapping K and S's colors ('Case 3 R' as seen in the terminal). As usual, source code in C can be found in our Github repo. 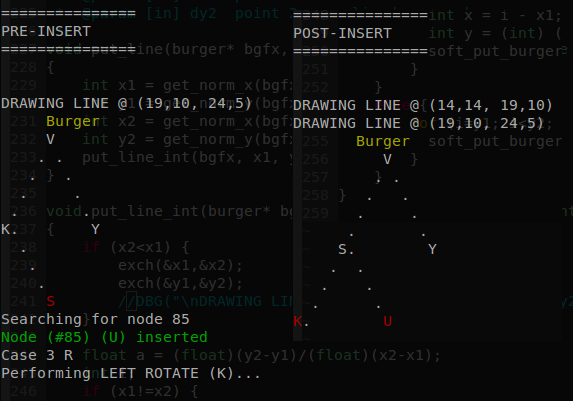 Simple testing is provided here (renders the tree in colored ASCII as seen in this post). Only insertion is implemented for now (as is the case with AVL); hopefully I’ll implement deletion in the future. ² This choice may seem arbitrary, but definitively helps us to not violate rule 4, which is potentially more complicated to enforce than rule 3.